Over the past few weeks, we’ve had a chance to spend some quality time alone with both LG and Samsung’s curved OLED TVs. And while the technology behind the TV’s and their shapes are similar, there are plenty of factors distinguishing one from the other. With that in mind, let’s compare them. First, let’s start with the obvious stuff. Samsung has gone with what it calls a “Timeless Arena” design. We call it a frame. This frame provides some advantages in that it houses a built-in camera up top and speakers at the bottom. On the other hand, the frame obscures the visual appeal of the TV’s curvature and takes up a lot more space than if the panel stood alone. LG’s panel does stand alone, opting for a clear acrylic base. 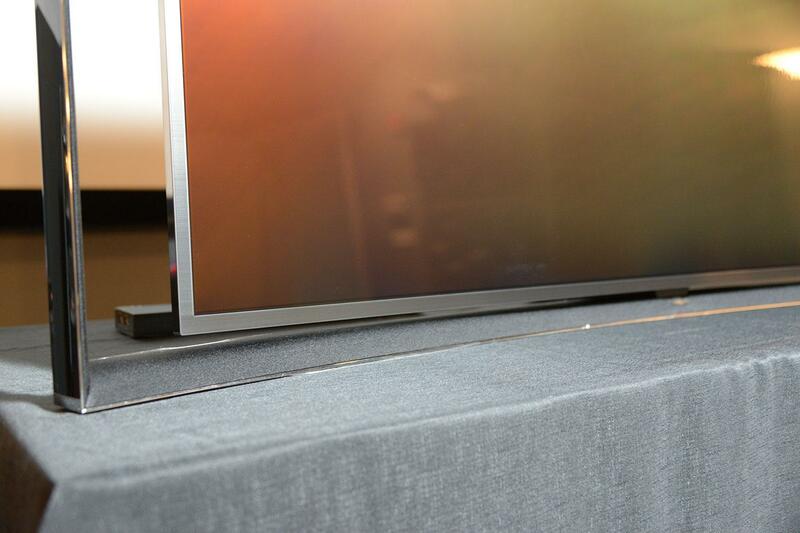 This shows off the TV’s thin profile and gentle curves much better. However, the clear speakers in use here don’t sound very good. Speaking of speakers, Samsung houses a small subwoofer inside the sealed panel of the TV. There’s no grill and no port to be found anywhere. It actually uses the TV cabinet as a sort of radiator – a weird design choice, but effective. LG’s OLED houses its inputs like most TV’s do: on the back of the TV. This makes for a little bit of a bump on the center of the TV’s back panel, though LG’s is thinner overall. 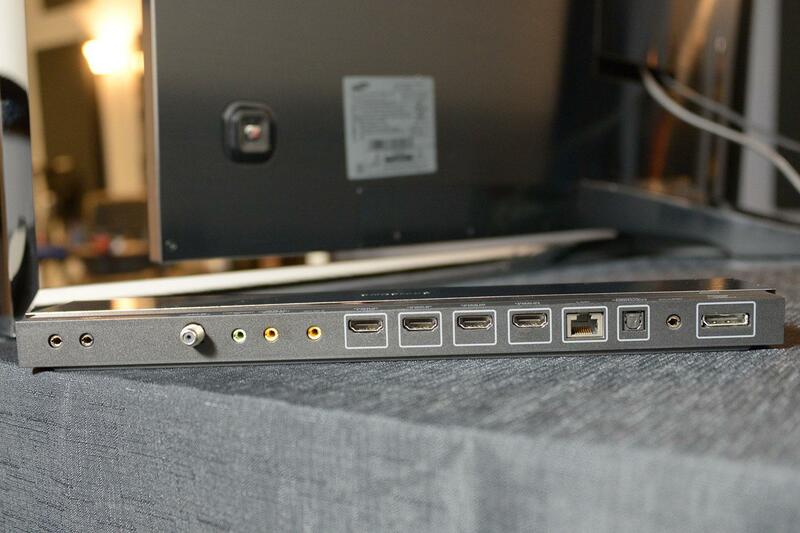 Samsung’s breakout box with “one connect” output port on the right. 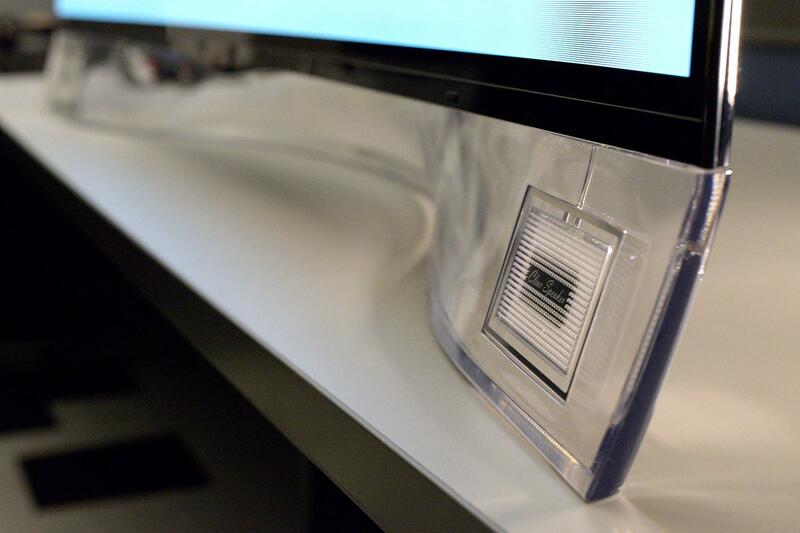 Samsung’s OLED has a completely smooth back panel, with all of the inputs housed in a breakout box. From there, signal is sent to the TV by a proprietary “one connect” cable. If you could mount this TV on the wall, that would be a real advantage. 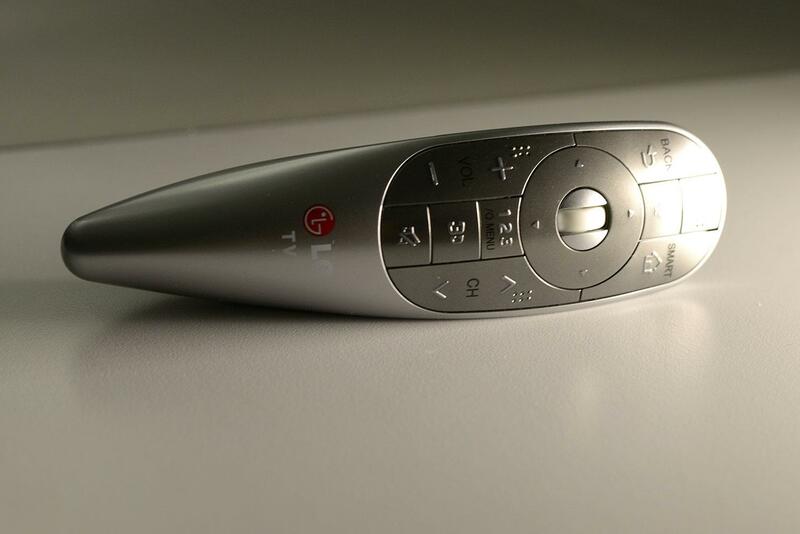 LG is sticking with its Magic Motion remote. It took us some getting used to, but now we really like it. So does our 4-year-old daughter. She’s a master with this thing. That’s probably because it’s such a familiar feel. You use it like you would a Wii remote, pointing and clicking at the TV. Samsung, however, uses a touch-pad remote, so you do more swiping than you do waving. We’ve not had as much time with this remote, but didn’t enjoy it the first time out, like we’d hoped. That may change as we get a little more used to it, though. To be frank, Samsung’s got a pretty clear advantage when it comes to a smart TV interface. And we’re not talking about its inclusion of gesture control or voice recognition elements, which we don’t think add any value to the user experience. Rather, Samsung’s got the edge because of its live TV integration and content recommendation engine. You can also search across all available video-on-demand apps to help find out which service has what you want to watch. Samsung’s five-segment smart TV interface just works. This isn’t to say LG’s is poor – it isn’t. We just like Samsung’s better. When we tested LG’s OLED, we noticed that bright white test patterns were dimmed over time. We confirmed with LG that this was intentional and is a sort of image retention abatement measure. Samsung’s TV doesn’t do this. 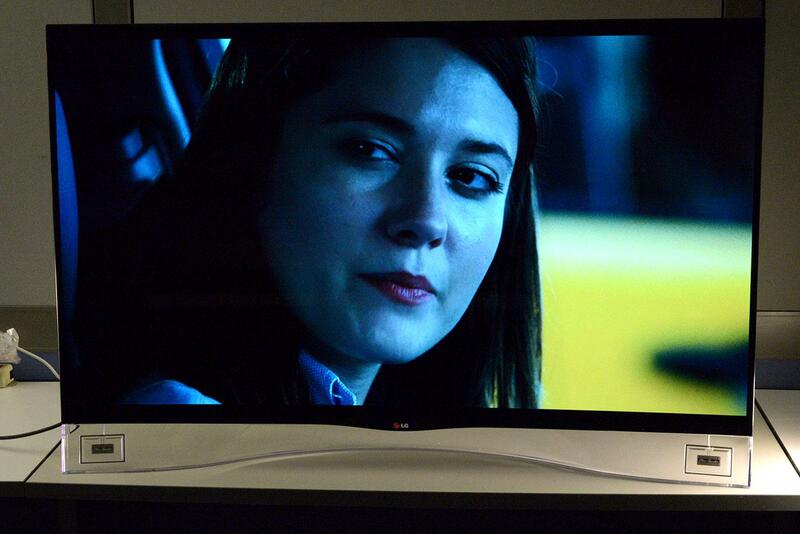 However, we never noted any image retention issues during our testing of Samsung’s TV, either. This may have something to do with the difference in approach to OLED panel design discussed next. Samsung and LG take slightly different design approaches to their OLED panels. LG uses four white sub-pixels, then lays color filters over three of them to create red, green, blue, and white. The design is meant to increase efficiency and brightness. Samsung, on the other hand, uses red, green, and blue OLED pixels, but the blue sub-pixel is twice as large as the red and green one. This may be a measure to combat the faster decay of the compound used for the blue OLED. Both of these TV’s look excellent. We spent a lot of time staring in awe at their perfect black levels, impressive brightness, eye-popping color and quick response times. We’d love to tell you how the two compare side-by-side – but that would be irresponsible because we haven’t actually seen the two side-by-side. We’re working on that, though, and hope to have an update soon. For now, try to be satisfied knowing that both look outstanding. We believe it is too soon to make a big deal out of one of the most obvious considerations: price. That’s because we believe the price on LG’s TV will go down in the near future. Presently, LG’s model is priced at $15,000 and Samsung’s is priced at $9,000. That’s a huge gap, and although LG’s official statement is that it is staying the course on its price, we can’t imagine that will last too long. A chasm that wide simply must be narrowed.